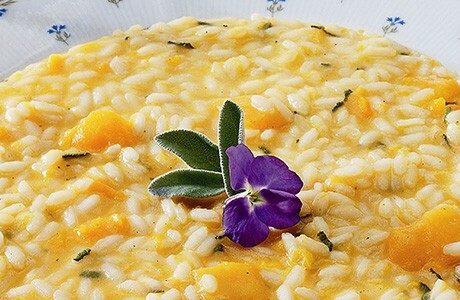 Often used in Italian Cuisine, pumpkin provides a comforting addition to this risotto. The addition of fresh, hot red pepper gives a spicy kick to this dish. Chop the onion and the pumpkin; remove the stem and seeds from the red pepper and cut into small pieces. Heat a little extra virgin olive oil in a saucepan and lightly fry the onion, pumpkin, red pepper and the rice. Add the thick vegetable stock and stir continuously for 10 minutes until the risotto becomes creamy. Season with salt and pepper to taste. Add the butter and the grated parmesan cheese, stir well and serve.